Monster Energy Honda Team rider Kevin Benavides is a stone’s throw away from a final overall podium place when Saturday’s last stage concludes in Cordoba, Argentina. He performed well to keep his rivals in check and to cut down the difference that separates him from the leader by nine minutes. 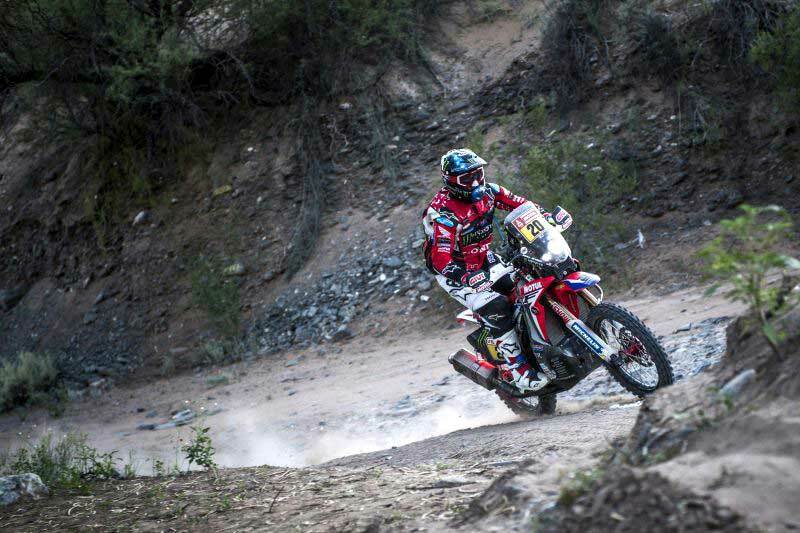 The Argentine rider finished 2nd, two minutes behind the winner of the special and Saturday he should be able to confirm his position on the final day of the 40th Dakar Rally. "I rode a good stage, which was hard but where I had a lot of fun on the sand tracks," said Benavides. "I had a minor fall but I pushed hard and was able to take some time back the leader. Saturday I will go out and try to ride an intelligent race. We are going to try to take it carefully because there are several dangers and you can’t mess around." American Ricky Brabec has unable to finish the first special after suffering an electrical problem. Brabec was in 4th position on the day and in sixth overall spot. "It was very unfortunate on the penultimate day for me to have an electric issue and they forced me to quit, as they only gave me an hour to get moving again," said Brabec. "We’ll just have to keep working hard towards next year. I’m sorry to all friends and fans whom I haven’t been able to keep up to date recently. Thank you all very much for the support." The young Chilean rider José Ignacio Cornejo, riding the bike of Portuguese retiree Paulo Gonçalves, stopped to try and help out team-mate Ricky Brabec, but was not able to assist him and get the American back into the race. In spite of conceding 45 minutes, the rider still remains in the top ten in the general rankings of the race. "For now we are very happy with the results that Kevin has been achieving. We hope it continues like this and let’s see how it ends," said Teammanager Raul Castells. "I hope he finishes second, which would be a very good position for the Dakar that he has been riding over the last two weeks of racing. I also want to highlight the work of José Ignacio Cornejo, who until now had been having a great Dakar. Too bad that Ricky Brabec had an electrical problem and was unable to finish. Hopefully everything goes well on the final day."